lately, i’ve been lamenting the fact that i don’t have enough lounge-y clothes. fact is, as soon as dinner is over and the dishes done, i sprint for my comfy clothes! problem is, i don’t really have that many to pick from. i have some yoga pants that i’ve worn for ages and really need at least one other pair to switch off with, and any leggings i have are too thin to wear without bootay coverage. the problem with RTW yoga pants is that they are expensive, always too short, and made of horrid synthetics. and RTW leggings… well, too thin and hahaha as if they can make it over my bum! i haven’t done the yoga pants yet (though i really want to try this maria denmark pattern), but i finally did make leggings. i ordered the most dreamy black modal/rayon/amazingness knit fabric from girlcharlee.com. and holy moses, i wish i could pass a little swatch to each and every one of you this stuff is amazingly awesome! it’s super stretchy, matte, thick, and feels amazing! did i mention amazing? i used mccalls 6173 and went down a size from the recommended, and added 1″ to the back rise, grading to nothing toward the sides. from mid-thigh down, they were huge. granted, my fabric had far more stretchiness than called for, but i had to remove inches in width. i left the bum area alone (no need for the fabric there to be stretched to max capacity) then kept tapering in and tapering in… and finally i arrived at what you see here. i am pleased that this pattern sits high enough to cover both my rear and my mushy mommy bits (most leggings give me severe muffin top). photo quality is pretty meh, i know. it’s been cloudy and rainy and i gave up waiting for it all to clear out… classic new england weather! i’m not really in the “leggings as pants” camp, but these cover and, since they’re black, hide the lumps and bumps pretty magically. 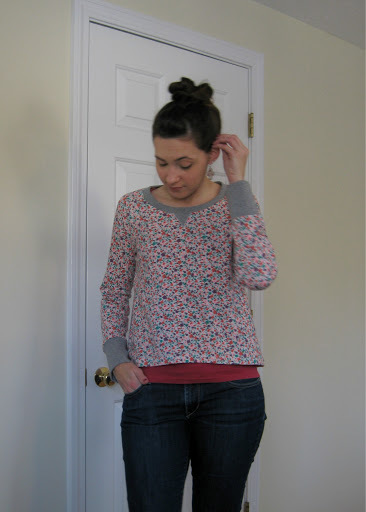 i’m really looking forward to making some longer tees (hemlock i’m looking at you!) and tunic length shirts to pair with them. and dude. leggings are flipping FAST to make. one pass up each leg, join the legs, then for the waistband i serged 1″ elastic to the inside top SA, then flipped it down and zig zagged it in place along the lower edge of the elastic. had i not needed to go back and fiddle with the leg width, these would have been cut and finished within the hour. oh hey, i also made my top! this is a sweatshirt-type knit, maybe a french terry? i really don’t know. 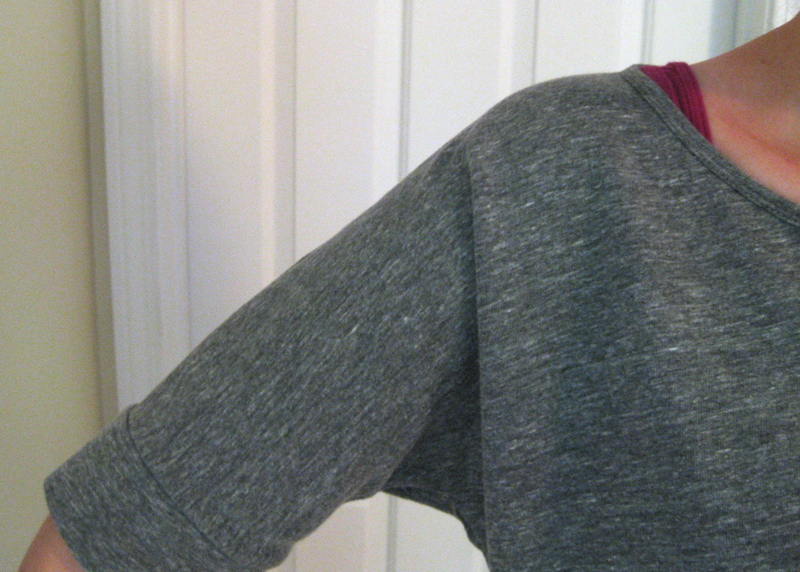 it doesn’t have much stretch, so i took my dolman top from cation designs and added a total of 4″ in width, 1″ in length, and lowered the front neckline by 1″. my original pattern printed off-scale, so i can’t necessarily give you specifics, but you get the idea—i was aiming for a sweatshirt type top. i kept the hem band smaller to hug my hips, and did a narrow neckline binding. i made this one a few weeks ago and i’ve pretty much lived in it ever since! 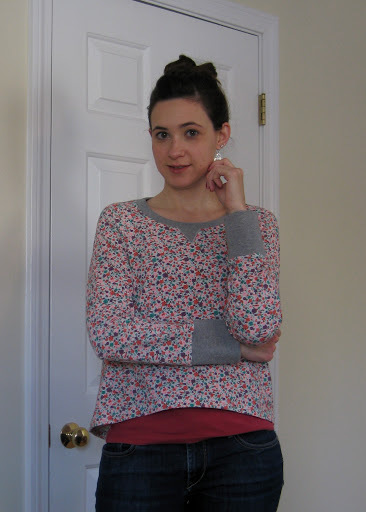 after i cut this top out i started to doubt whether or not a short sleeve sweatshirt was going to be very useful, but it seems to be just the right weight for chilly evenings. plus, i’m constantly pushing up long sleeves, so this turns out to be extremely useful. wow guys, i’m totally hooked on loungewear! hopefully i can make more of it, especially as fall comes around. with my current lack of interest in buying RTW, these are great pieces and near-instant gratification because they are so darned fast to sew! new years day i started coming down with a cold. there is nothing like starting to feel sick that highlights to me my lack of lazying around the house clothes. i immediately remembered that dixie DIY has a free (yes free!) hot cocoa sweater pattern that would fit the bill. i had to run to the fabric store to pick up a couple $1 mccalls patterns (namely a button down shirt for the hubs. wooo! look at me all growed up and being unselfish!) so i browsed the red tag table to see if i could score a nice knit. and what do you know, this small floral print caught my eye. it’s 100% rayon knit. 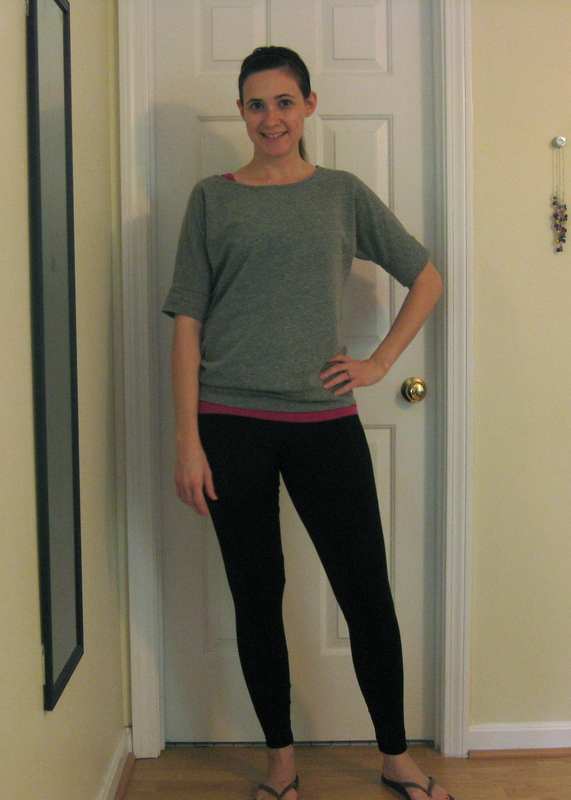 i typically associate rayon knits with lighter-weight drape-y stuff, but this one was nice and stable. for $5/yd i couldn’t pass it up. yesterday i traced off the pattern, then spent some time in the evening to sew it up. i thought the floral print might be a little too busy or young looking, but i don’t really care. i just wanted a cozy top. i happened to have this grey knit leftover from anastasia’s coat and there was just enough to cut the cuffs and neck binding. it helps to break up the floral i think. then i thought, hey why not add that little triangle patch you see on sweatshirts? i really have no idea what it’s there for, but the more i sew the more i notice the truly random details on rtw. so why the heck not? i cut a triangle patch and zig zagged the edges down before constructing the top. this could not have been an easier top to make! the raglan sleeve is wicked fast to put together. dixie offered this pattern in one size, which just happened to be my size, so the only changes i made were lengthening it by 1″, then adding 1/2″ at the hem so i could turn a 3/4″ hem instead of the drafted 1/4″. i have monkey arms so i made my cuff 4″ so the sleeves would be long enough. i prefer a wide cuff so this worked out just fine. by the way, all the seams have a 1/4″ SA. i love her for that! so much easier to sew and a fabric saver to boot. hi-low hem! look at me being all trendy. 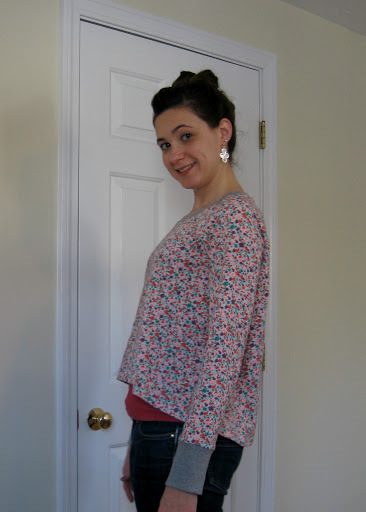 i have a few leftover projects unblogged from 2012, my 2012 favorite makes, what i want to accomplish this year… i’ll get to all of that, it’s just really nice for once to blog a fresh off the serger project. i’m so glad i have this top to lounge in today. not only am i nursing a cold but it’s currently 10 F outside. that would be -12 C for you metric folks. brrrrrrrr!!! !